During Chī Sáu 黐手 you will often find people with long, strong arms like to use Laap Sáu 擸手 to pull your arm and hit your face with the other hand. As they are so strong and have such a long reach it is quite difficult to defend. Generally however, these people will only use these techniques on a more junior student and as it works they do it all the time. However, senior students are not afraid of this technique. This is because when they try to pull a senior’s arm the senior can stop it a number of ways. 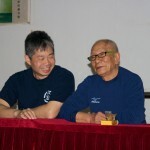 The first way senior will use his or her Gūng Lihk 功力. This is their internal power and the seniors can use it to make themselves feel as solid as a rock so that other person cannot move them. When they pull they suddenly find they cannot move them and the senior can hit them. 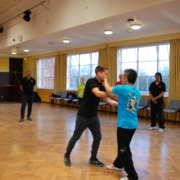 The other way is the senior follows their energy so that when they pull you move forwards towards them and use your other hand to hit their face and this hit can be quite hard. Since their attack is usually fast you have to move even faster so that you follow their energy and give them nothing to pull, making them move slower. As you move in you immediately attack and in this way you will use his strength and add it to your strength and this is what makes your counter hit very powerful.